LeRhonda Renee Hedgepeth was born on September 18, 1989 in Nash County, North Carolina to James and Brenda Lawrence. She transitioned into glory on Saturday, August 4, 2018. LeRhonda accepted Jesus Christ as her Lord and Savior and joined the Greater Joy Baptist Church in Rocky Mount, North Carolina on December 15, 2013, where she attended until her health failed her. LeRhonda attended and graduated from Nash Central High School in 2008. She was employed with Bojangles as a Co-manager for over ten years until her illness. LeRhonda touched many lives and was loved by many. She will be remembered for her beautiful smile, deep conversations, heart of gold and the love she showed to everyone she met. LeRhonda will also be remembered for her strength while battling her sickness, she truly fought a good fight and finished her course with dignity and respect, remaining ever so humble, and never complaining. 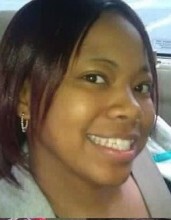 LeRhonda was extremely family oriented, she loved family gatherings and loved to eat. She would ask her mom and dad “what are we going to eat” or she would say, “mom I’m hungry” or “dad I’m hungry”. LeRhonda truly loved her family and was more concerned with their well being than her own. LeRhonda was preceded in death by her paternal grandparents, James and Pearl Lawrence, her maternal grandfather, William Henry Norwood and one paternal aunt, Myrna Lawrence. LeRhonda leaves to cherish her beautiful memory: her four year old son, Zayvion Monte Joyner of Rocky Mount NC; her parents, James and Brenda Lawrence of Rocky Mount, NC; three sisters, Danchelle Hedgepeth and Takiya Peoples (Corey) both of Rocky Mount NC and Erika Lawrence Street (Stonandron) of Lawton, OK; one brother, James Roderick Lawrence (Whitney) of Rocky Mount, NC; five nephews, Jaquon, Nakhi, Alijah, Nazir and Zymir; three nieces, Avante, Aayannah and Sanaa; maternal grandparents, Leonard Jr. and Janice Alston of Nashville, NC and Bernice Norwood of Maryland; eight aunts and three uncles; her significant other, Blakie Monte Joyner and her extended family, Bruce, Freda Daleisha and Kenny Joyner all of Rocky Mount, NC; a host of other relatives and friends.